I’ve seen Gennady Golovkin fight about 6 times. Each time I’ve watched him on television (on 4 of the 6 occasions), Golovkin has been spectacular. I go to see this guy fight live twice, and while the results were great for Golovkin, I feel like I got the short end of the stick. WHY ME? So my first opportunity comes up to see Gennady Golovkin fight live. Madison Square Garden, January 19, 2013. The crowd was loud and the house was packed. I was excited and Gabriel Rosado would become victim #25. Gabriel didn’t go down without a fight. Golovkin battered and bloodied Gabriel until Rosado’s corner stopped it with Gabriel still fighting and on his feet. Wait a minute! Gabe was still fighting and the corner stopped it! Where is my knockout? WHY ME? In the 5th round, Rosado landed something that caused a bruise under Golovkin’s eye. A bruise? Gennady? You never bruised when I saw you on TV. WHY ME? I get see you live and strange things happen? Then we find out Gennady had the flu and wasn’t up to par health-wise. But Gennady, you were never sick in any of the fights I saw on TV. WHY ME? I felt a little cheated. I felt the win was watered down a bit. I wanted to see a real knockout. A Golovkin sized knockout. Corner stoppage… WHY ME? So months later Gennady’s team decides to put him back in at The Garden. I’m there again. This time it was against Curtis Stevens. Stevens had done so much talking prior to the fight that this was bound to be a war that wouldn’t go past 4 rounds, tops. Stevens went so far as to even have a mock burial with a coffin reading “RIP GGG”. There was a special buzz in MSG that night and when Golovkin dropped Stevens in the second round with a double left hook, I KNEW a vicious follow up would soon follow. Stevens not only survived the round, but by the fourth and fifth rounds he was landing his share of shots on Golovkin. In the next couple of rounds Golovkin took over and began to punish Stevens. Stevens’ trainers told the referee that Curtis had enough and stopped the fight between the eighth and ninth rounds. Wait a minute! This was anti-climactic! Where is the KO? Where is the follow-up flurry to score another knockdown? WHY ME? On television I see Golovkin knockouts and TKOs in the middle of the action. Then I watch Golovkin live for the second time and it’s another corner stoppage? Are you serious? Corner stoppage… WHY ME? 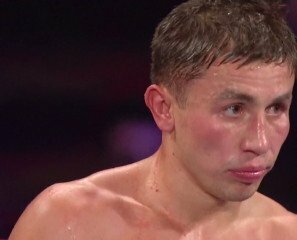 My plan was to box,” Golovkin told HBO’s Max Kellerman. “I know I’m better. My trainer (Abel Sanchez) told me, no crazy stuff. No street fighting. Just get in there and box.” Hold on Gennady. I know I’m better? My plan was to box? Just get in there and box? No street fighting? Gennady, was this the plan in those knockout fights that I saw on TV? You owe me pal! This isn’t what I came to see. WHY ME? Sandwiched in between the live Golovkin fights was a trip to Las Vegas to see Floyd Mayweather vs. Robert Guerrero. I never saw Floyd fight live, but I’ve seen him fight on television at least 15 times. I couldn’t wait until fight night. I love the shoulder roll and shell defenses he uses. I couldn’t wait to see at least a couple of rounds where he lays on the ropes and let’s Guerrero fire away to see if he can solve the puzzle. Leading up to the fight Guerrero told Floyd to fight toe to toe (see the initial All Access coverage). Once Floyd agreed to it, I thought it would make for an interesting scrap, at least in some rounds. Fight night came and after Floyd was led to the ring by Lil Wayne, the bell sounds. Floyd is moving and dancing and Guerrero is finding early success. I just have to wonder how Floyd is going to deal with the heat once he slows down and plays those ropes. Round after round and Floyd is moving like he’s 26 years old, not 36. What’s going on? Where is the shoulder role that I’ve seen him use in EVERY DAMN FIGHT that I watched on television? WHY ME? He promised Guerrero (actually a psych job at the time) on All Access that he’d go toe to toe. Then Money May moves and glides like Pretty Boy Floyd did years ago. But even Pretty Boy used the shoulder roll on the ropes back then. I finally get to see the guy fight like I’ve seen at least 15 times prior and he miraculously gets his legs back. No shoulder roll. Thanks Floyd. WHY ME? Finally, I’ve seen Adrien Broner fight on television maybe 6 or 7 times. Each time there was a knockout. On fight night, Broner appears to be two weight classes bigger than his opponents. So when he came to the east coast to fight Paulie Malignaggi, I figured I go see the kid fight live. Surely, he’d dominate Malignaggi who was not only smaller, but a guy who had only 7 knockouts is 37 fights. On top of that, Paulie is a part time boxer and part time boxing analyst for Showtime. So he’s not 100% involved in boxing in the ring. Also, Paulie was a 32 year old guy coming off a 10 month layoff. To make matters worse, his fight prior to Broner was considered a gift decision against Pablo Cesar Cano. This fight had knockout written all over it. For the younger and much bigger Broner, there would be no question as to him coming in and walking Paulie down- especially with Paulie’s lack of power. It was only a matter of which round he would end it. Fight time began and Paulie opened up well. But it was a matter of time before Broner picked his spot and dropped Paulie with the uppercut or a hook the body. Only a matter of time, right? WHY ME? Round after round Paulie outworks Broner and Broner lands a few power shots that may have won certain rounds for him. Same power shots he landed in EVERY DAMN FIGHT I saw on television. But instead of following up and finishing Paulie, Broner allowed Paulie to come back and keep working. Where’s the finish Adrien? Where’s the KO? I see KOs from you on television and now I get to see you live in a fight where you are heavily favored. No KO? Okay, how about a knockdown or two? Gimme the magic I see on TV Adrien. Where is the magic? It wasn’t to be on this night. You had 6 KOs in a row and here is a fight where fans and experts agreed that you’d win by KO and you don’t. The one time I come see you fight live. WHY ME? The fight actually went to split decision and Broner escaped with the win, Paulie’s belt, and I guess his ex-girlfriend too. A sure fire KO fight that I attended live and nothing close to a knockdown, let alone knockout is produced. I have to wonder if I’m cursed. Fans, if you’ve had any moments like this in boxing, leave your comments in the section below. On December 14 when Broner fights Marcos Maidana, I’ll be watching it on TV. I guess Adrien will win by brutal knockout just because I’m not there watching it live. WHY ME? You are here: Home / Boxing News / Why me?